Is there anything more fall-like than the aroma of a stew or soup bubbling away while you putter around the house? 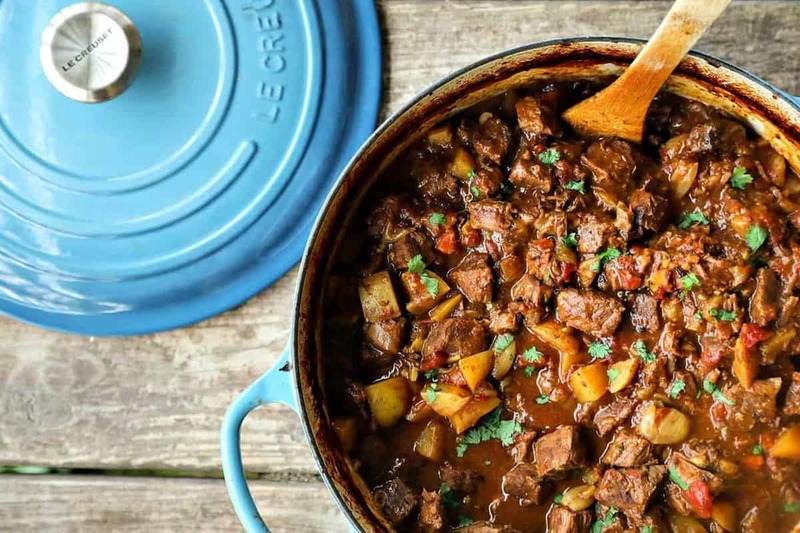 Curried Beef Oven Stew is super high on the comfort scale; it is filled with tender beef cubes, potatoes, carrots, and onions all slow-cooked in a flavourful gravy made with soul-warming curry spices. While I don’t object to stew made in a slow-cooker, this stew perks away gently in the oven. It really is no less convenient to bake your stew rather than plunk it into a slow-cooker and you get some benefits from the method, too. …but back to this Curried Beef Oven Stew, friends. It’s the kind of stew that you eagerly anticipate all day long when you know you get to have it at night. And mercifully, it tastes even better on the day after it’s made, so it is tailor made for large batch cooking on the weekend and eating off of for a couple of days. Even better, it freezes and reheats like a dream. 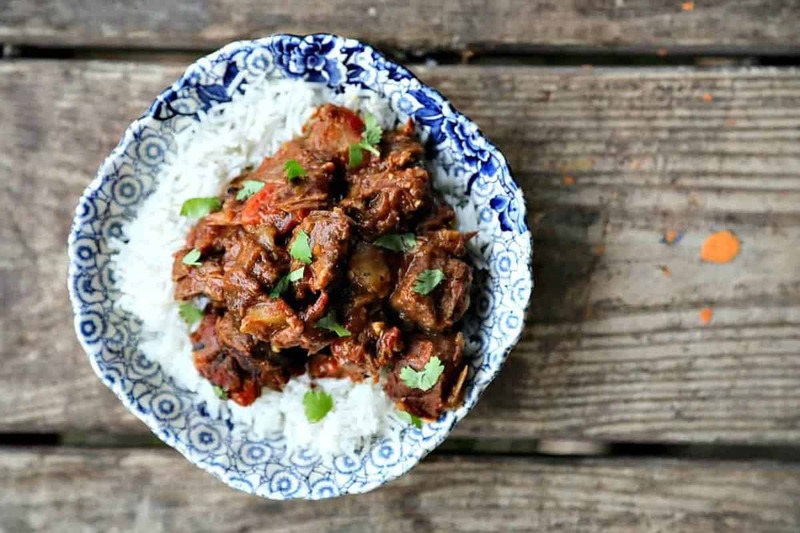 Keeping a couple of containers of Curried Beef Stew stashed in the freezer is like having money in the bank for those busy nights when you need to feed your body and soul but just don’t have time to put in in the kitchen. This recipe is pretty fuss-free, but you should not skip the browning of the meat. That’s an integral part of the flavour building. And don’t fret the build up of stuff on the bottom of the pot as you brown it, because that will all incorporate into your final gravy and gives a major boost to the savouriness of the final dish. Be sure you use a heavy dutch oven or soup pot that has an oven safe lid. You’ll want to use one that has a capacity of at least 5 quarts to allow for bubbling inside the pot. Dutch Oven. Pictured here is the Le Creuset 9 quart dutch oven. If that is outside of your budget, this less expensive one will work, too. 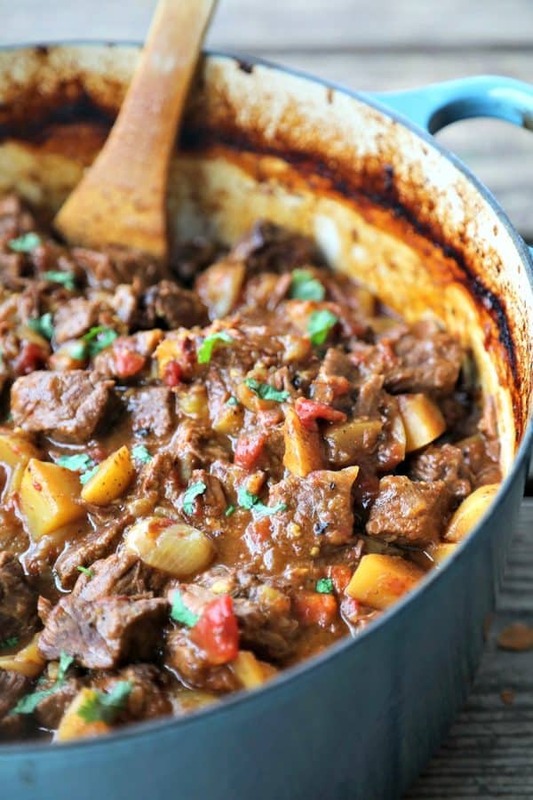 Curried Beef Oven Stew is filled with tender beef cubes, potatoes, carrots, & onions slow-cooked in a flavourful gravy made with soul-warming curry spices. In a small bowl, use a fork to combine the flour, salt, and pepper then sprinkle over the beef cubes on the cutting board. Toss to coat evenly. Place your dutch oven over medium high heat and add in about one tablespoon of the oil. Heat until shimmery. Add in enough beef cubes to cover the bottom of the pan without crowding it. Without stirring, let them brown on the first side, about 3 minutes, then flip the pieces. Continue browning on each side. Transfer to a plate with an edge to hold juices. Repeat with the remaining oil and beef, taking care not to crowd the pan, until all the cubes have been browned. Return the cubes to the pan after the last batch, sprinkle the curry powder, brown sugar, garlic, and ginger over the beef and stir to coat. Cook, stirring a couple of times, until the curry is fragrant, about 1 to 2 minutes. Pour in the tomatoes with their juices and the beef stock and raise the heat to high. Bring the contents of the pot to a boil, stirring and scraping the bottom of the pan to release all the flavourful browned bits into the sauce. Stir in the onions, carrots, celery, soy sauce, fish sauce, and bay leaves, cover the pot, and place on a rimmed baking sheet in the oven. Bake, covered, for 2 hours, stirring at the one hour mark. Stir in the potatoes, re-cover the pot, and bake for another 1 hour and 30 minutes, or until the beef and vegetables are all quite tender. Remove the bay leaves and serve alone or over rice with chopped fresh parsley, cilantro, or green onions. 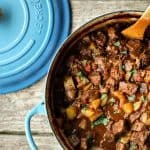 Looking for more recipes like Curried Beef Oven Stew? Try these! Thanks for the recipe! I made this today, and it was very good. The only thing I did differently was to dice 2 cups of yellow onions and use those instead of the pearl onions. Even my chef husband liked it! I will definitely be making this again! I made this tonight and I think the sky opened and I heard angels singing. YUM. The apartment I’m living in doesn’t have an oven. If I wanted to make this in a crock-pot, any ideas on how long I should cook it? The apartment I’m living in doesn’t have an oven. Any tips on how to cook this in a crockpot? I made this stew and it has to be one of the most flavorful I have ever eaten. I loved it. Mine was a little spicy cause I accidentally bought salsa style fire roasted tomatoes but it was a welcome surprise!